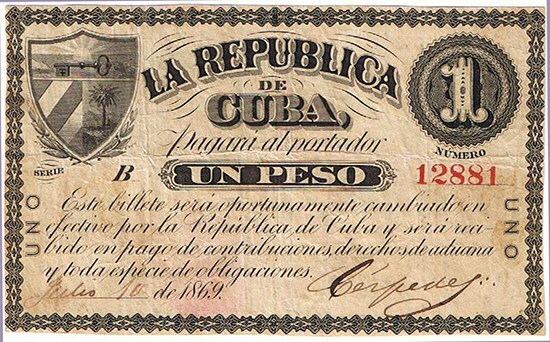 The 1869 series of Cuban paper money is historically important as it is the first currency to bear the name “The Republic of Cuba”, and it records the beginning of a 10-year war of independence against Spain. An examination of the 1-peso issue of this series is a good case study to help the collecting community better understand the different varieties of this series that are known to exist. Before the varieties of the Cuban 1869 1-peso are discussed in detail, it is helpful to first understand the historical context surrounding the time period. In 1493, Christopher Columbus discovered Cuba, and by the middle of the 16th century the island had become the maritime center of the powerful Spanish Empire. However, by the middle of the 19th century, the Empire was in decline and the Cuban people affected by colonial rule had grown increasingly restless. Carlos Manual de Cespedes y del Castillo was born in Bayamo, Cuba on April 18, 1819. He came from a wealthy creole family which allowed him the opportunity to study at the University of Havana, continue his studies in Madrid, and travel throughout Europe. He came to believe that the Spanish Colonial regime in Cuba was hindering economic development, limiting cultural life, and discriminating against the native-born. He chose the path of revolution and was one of the key men in the first war for independence. On October 10, 1868, at his La Demajagua sugar mill in the eastern region of Cuba, Cespedes freed the slaves, proclaimed independence, and rose up in arms against Spain. He was named President of the Republic of Cuba’s revolutionary government in April 1869. By 1877, tensions among rebel leaders weakened the Cuban Independence movement and the rebels had run out of material resources. In 1878, the rebel leaders and the Spanish government signed the Pact of Zanjon which officially ended the Ten Years’ War. Although the Ten Years’ War failed to achieve independence and resulted in the lost lives of thousands of combatants and civilians, the events proved that the Cubans could organize against Spain and laid the groundwork for future revolution. 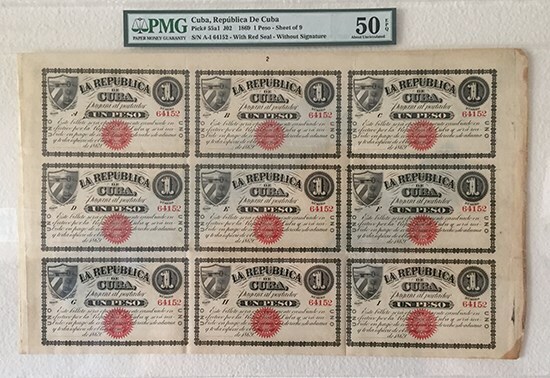 From a numismatic point of view, the war left a wealth of historical collectibles - including the first paper money to declare the sovereignty of the nation of the Republic of Cuba. On December 3, 1868, Cespedes instructed Jorge Morales Lemus to prepare the necessary arrangements to order an issue of two million pesos in paper currency. Jose Morales Lemus was the President of a revolutionary militant group operating in New York to raise funds for the liberation of Cuba from Spain. Though not officially recognized by the United States Government, the militant group was active in the United States spreading pro-Cuban propaganda and providing moral and monetary support to the Cuban rebels. The first printing of these engraved notes was done in New York between May and June of 1869 for the 1 (Pick #55), 5 (Pick #56), 10 (Pick #57), and 50 (Pick #58) pesos denominations, and later included the 50 centavos (Pick #54), 100, 500 (Pick #59), and 1000 (Pick #60) pesos denominations. 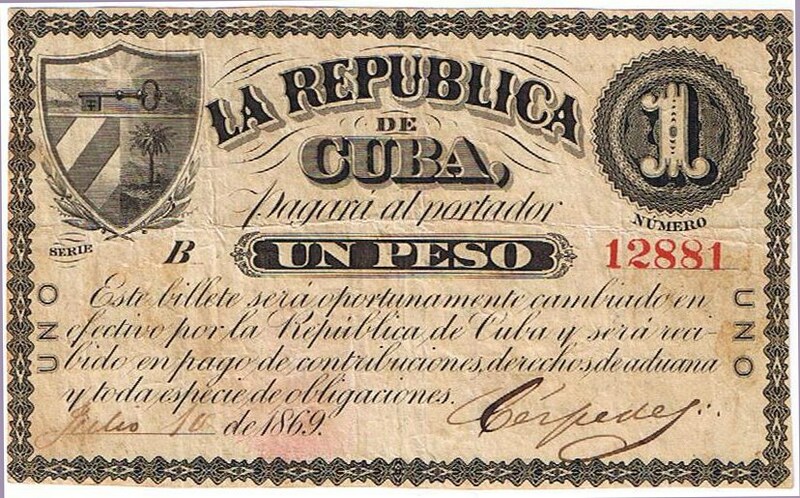 On July 9, 1869 in Sabanilla de Sabanicu, Cuba, a law was decreed that authorized the Executive Branch of the Republic of Cuba in Arms to circulate paper money in the liberated territories by the Liberating Army. These notes circulated between rebel forces and civilians; however, people generally preferred the precious metal content of Spanish gold and silver coins over paper money that was essentially conditionally backed on the military defeat of the Spanish. Furthermore, holders of these notes risked being killed by the Spanish authorities if they were caught with them on their possession! It is not known what exact amount of the 2 million pesos ordered were printed or what amount circulated. No examples of the 100 pesos denomination are known today, leading to the presumption that 100 pesos denomination was never printed. There have also been reports of those responsible for issuance of the notes burying notes in Cuba towards the end of the war. The uniface 1-peso notes of the 1869 series offers a detailed look into the many varieties of this series known to exist – including some that are not well understood by the collecting community. These 1-peso notes were printed on sheets of 9 (nine) notes. Pavel Meleg, in his book “Cuba 1781-1898, Paper Money of the Spanish Colonial Period”, provides more detail and expands the number of varieties to 8 (eight) with each variety being given a reference number starting with a “J02” prefix. Both Pick# 55a and 55b are simply unsigned remainders; Pick #55a with red seal (Meleg J02-sr, with J02 being an uncut sheet of 9, as shown above), and Pick #55b without red seal (Meleg J02a-ss). However, this is not the case. 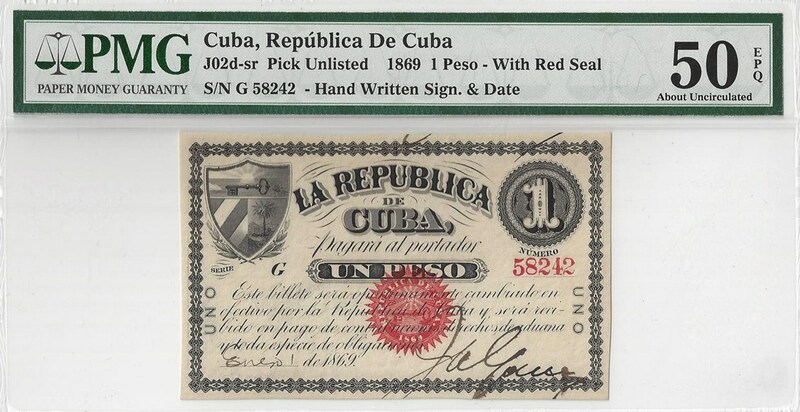 Given Cespedes oversaw the Republic of Cuba and was busy fighting a war with the Spanish, he did not practically have the time to sign every single note that was issued. Thus, his stamped/printed signature was sometimes used, creating a different “Cespedes printed” signature variety. Interestingly, what can clearly be seen on all known issued “without” red seal varieties is in fact a very faint remnant portion of a red seal (as can be made out in the pictures of J02c-s and J02b-ss above). The red seal remnant can usually be seen by eye, but sometimes magnification is required to confirm the presence of the seal. Whether the red seal faded over time or was incorrectly printed is not fully understood. However, it is believed that all fully issued notes were made with a red seal. Thus, Meleg’s “Without Red Seal” varieties may be more properly called faded red seal varieties. However, they still serve to identify a distinct difference in varieties between those having a crisp, bright red seal and those that have a faded, barely perceptible red seal. 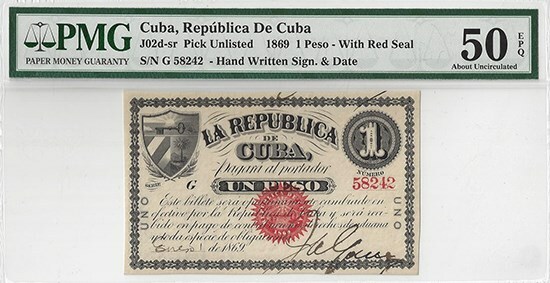 After examination of various 1-peso notes held in collections of Cuban Numismatic Association of America members, it has been found that the without/faded red seal occurs on all issued notes with serial numbers <= 48,127, and that the bright red seal is found on all issued notes with serial numbers >= 56,060. Therefore, it is speculated that the transition from the without/faded red seal variety to the bright red seal variety occurs at the 50,000 serial number mark. Could this change in red seal quality mark a transition from the first printing to a second printing where different quality ink was used? Over time, it is hoped that collectors will be able to help definitively define the transition serial number. Observant readers will notice that the Cespedes’ signature ends with three points, which identifies him as a freemason. 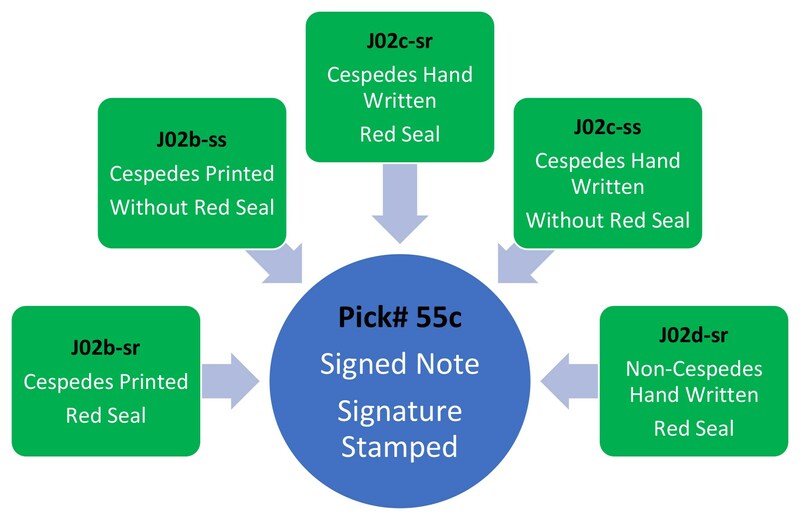 Cespedes hand-written notes are normally seen signed with black ink, but at least one example is known signed in red colored ink. According to the 1869 law, all notes should have been signed by Cespedes. 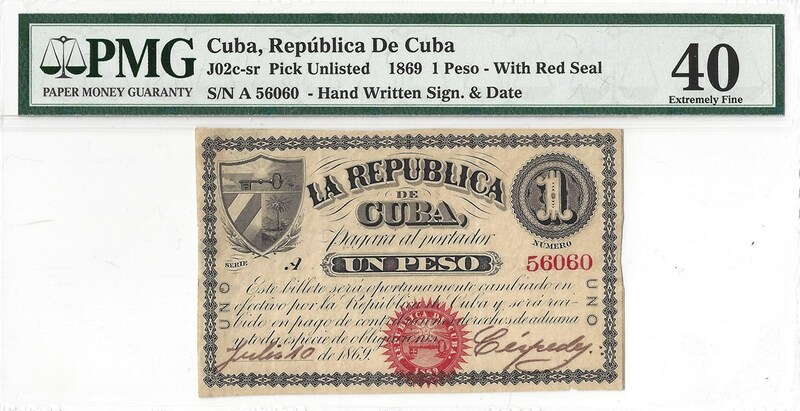 Thus, some Cuban numismatic experts are of the opinion that all non-Cespedes signed hand-written notes are spurious, and not officially issued. 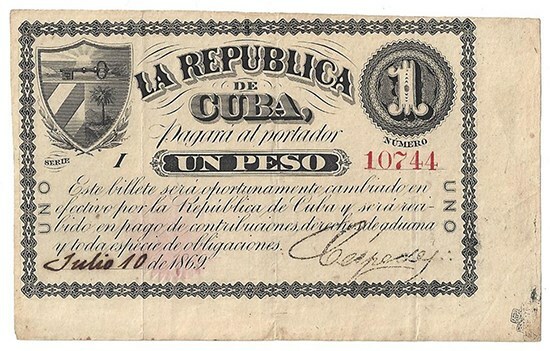 However, a 1980 article, “El Papel Moneda de la Republica en Armas”, by the Museo Numismatico, published by the Banco Nacional de Cuba states “…as the war became more dynamic, the rapid movements of Cespedes did not permanently allow direct custody of the money in his possession. In this situation, Cespedes gave power to General Vicente Garcia to take care of archives and paper money”. Given the chaotic, mobile war environment, it is certainly possible that some notes were issued and signed by designated officials other than Cespedes. All known non-Cespedes signed hand-written notes appear to have serial numbers above 55,000. Many of the signatures are legible and it would be an interesting study to attempt to link the non-Cespedes signatures to known Republic of Cuba officials of the time. For collectors wishing to learn more about Cuban paper money, they should consider joining the Cuban Numismatic Association of America (CNA). The CNA is a US-based registered not-for-profit organization under IRS Section 501(c)(3), and all dues, donations, and gifts to the CNA are fully tax deductible. The Association is affiliated with the American Numismatic Association (ANA) and Florida United Numismatists (FUN). It is not affiliated with the Cuban Government in any way. The goal of the CNA is to encourage, promote and disperse Cuban numismatic knowledge, collectible Cuban coins, currency, culture, education and fraternal relations among the numismatic community. The CNA has participants in almost every country in the world who have the common interest in studying, collecting, and sharing knowledge and friendship with others about numismatics of the island of Cuba. The CNA gathers annually at the Winter Convention of the Florida Numismatic Association (FUN), which is held in Orlando, Florida. Membership is US $20 to join and $10 every year thereafter for renewal and includes member restricted content such as access to the official CNA newsletters, updates, and member information. Go to the link http://www.cubannumismaticassociation.com/membership/ to join. 5) Acknowledgement is given to Pavel Meleg, Antonio Diaz, Ricardo Lopez, Joseph Crespo, and Richard Becker for information provided in this article.